Improved performance over the stock Dillon 550 reloading roller lever. 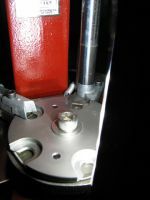 Designed to move you in closer to the reloading press and provide less drop when the handle is lowered. Your back and arms will thank you. 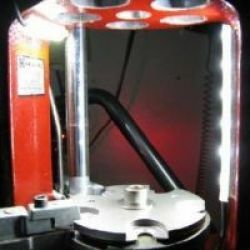 Lifts your Dillon 550 Reloading Press up 9-5/8" to get the shell plate closer to your eyes. Made of solid 3/16" steel construction, powder coated black and comes with a storage shelf below. Comes complete with 12 volt DC LED dome light, 120V Power Adapter, on/off switch and mounting hardware. 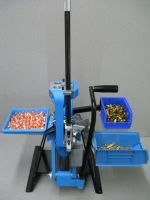 Improved performance over the stock Dillon 650 reloading roller lever. 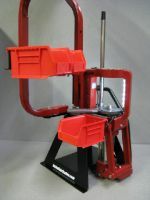 Designed to move you in closer to the reloading press and provide less drop when the handle is lowered. Your back and arms will thank you. 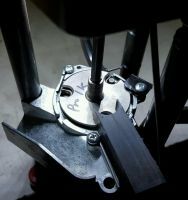 Lifts your Dillon 650 Reloading Press up 9-5/8" to get the shell plate closer to your eyes. Made of solid 3/16" steel construction, powder coated black and comes with a storage shelf below. Comes complete with 12 volt DC LED dome light, 4 inch LED lighting strip, 120V Power Adapter, on/off switch and mounting hardware. Improved performance over the stock Hornady LnL AP reloading roller lever. 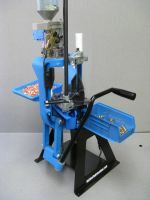 Designed to move you in closer to the reloading press and provide less drop when the handle is lowered. Your back and arms will thank you. 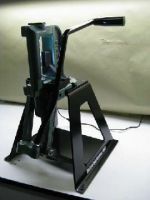 ATTENTION: This model is designed for a press that is mounted 30-36 inches off the floor. 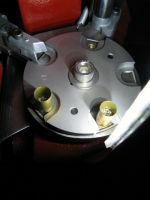 Lifts your Hornady LnL AP Reloading Press up 9-5/8" to get the shell plate closer to your eyes. Made of solid 3/16" steel construction, powder coated black and comes with a storage shelf below. Comes complete with 12 volt DC LED dome light, 120 volt Power Adapter, on/off switch and mounting hardware. Dome light mounts on the tool head out of your way. It can be rotated to throw the light where you want it. Lifts your RCBS Rockchucker, RC 1,2,3. Supreme, Pro 2000 and Turret Reloading Press up 9-5/8" to get the shell plate closer to your eyes. Made of solid 3/16" steel construction, powder coated black and comes with a storage shelf below. Comes complete with (1) 4 inch 12 volt DC LED lighting strip, 120 volt AC Adapter, on/off switch and mounting supplies. 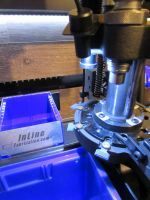 Mounts on the inside frame of your Reloading Press. Does NOT include the Dome Light. Comes complete with (1) 4 inch 12 volt DC LED lighting strip, (1) 2 inch LED Strip, 120 volt AC Adapter, on/off switch and mounting supplies. 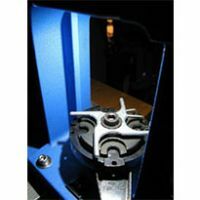 The 4 inch strip mounts on the inside frame of your Reloading Press and the 2 inch strip mounts on the ceiling of your press.